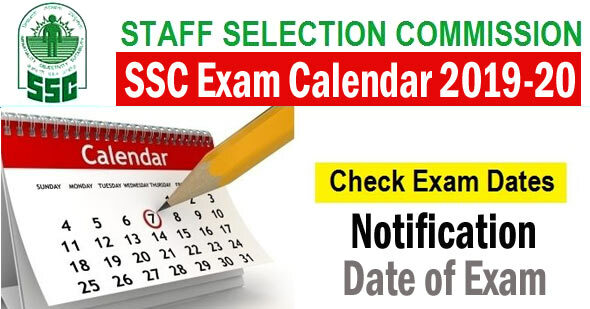 Staff Selection Commission (SSC) has released the exam calendar for the year 2019-20, the Period 1 January, 2019 to 31 March-2020. The exam calendar has the dates related to the advertisement, application form, and exam. SSC Exam Calendar 2019-20 according, SSC CGL tier I exam will be held from June 4 to 19, 2019 in computer based mode, while SSC CGL Tier II exam 2018 will be held from September 11 to 13, 2019. SSC CHSL Tier I exam 2018 will be held from July 1 to July 26, 2019 in computer based mode. The advertisement and application form for SSC CHSL Tier I exam 2018 will be available from March 5 to April 5, 2019.